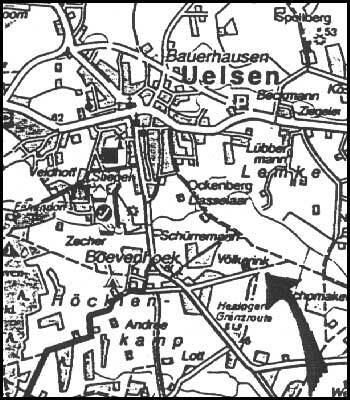 The map to the right shows the location of the homestead of Harm Hendrik Broene in relationship to Uelsen. The map below zooms in on the area, with the original location of the house shown by the green X. At one point, the house was moved to the location shown by the green arrow. Maps courtesy of The Broene Genealogy (1992), by Mary Arnold, Patricia Gemmen, and Shirley Krombeen.